MRS. WRENCH LIKES to add partially cooked cubed potatoes and sliced carrots to this stew during last 60 minutes of cooking time. Melt four tablespoons shortening (half butter) in Dutch oven. Cut two pounds venison into small pieces. Dip into mixture of flour, seasoned with salt and pepper. Brown meat in butter; add two chopped onions. Turn down heat. 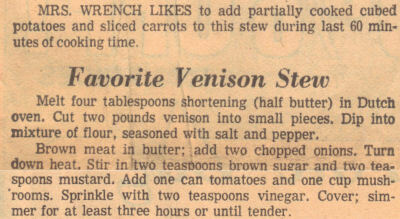 Stir in two teaspoons brown sugar and two teaspoons mustard. Add one can tomatoes and one cup mushrooms. Sprinkle with two teaspoons vinegar. Cover; simmer for at least three hours or until tender.